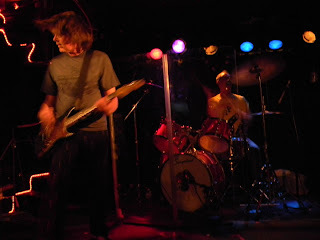 This evening's show at Subterranean was very enjoyable. The venue itself is intimate without being too close for comfort, and it's usually possible to find a good spot in the room (or upstairs balcony) to enjoy the show. Opening act The Poison Arrows kicked things off with a set of weighty shoegaze that tugs your ear in a number of directions without having anyone in particular to compare them to. Their frontman doesn't quite sing, but rather has a recitative chant that floats over heavy bass and drums, informed by guitar and synth effects. The only problem I had with the band, as their set wore on, was the increasing feeling of repetition I felt between their songs. They were all played at more or less the same tempo, which wouldn't be so bad if they'd employed a different form. Instead, most of the songs employed a rather narrow repertoire of musical devices and structure. They all had a kind of slow build to them, starting from nothing and working their way up to a big, epic middle section, which may or may not stop mid-song after a climactic moment (usually pausing for long enough that they confused the audience into applauding for the end of a song that wasn't half over yet), only to turn around and, after cementing the climactic moment by repeating it, dwindle the songs back down to nothing, with endings that feel more like fade-outs on albums than three guys playing things live on a stage (and who knows, on an album, it might work a lot better). The sonic textures they created were interesting and entertaining, but for my money, the overuse of a narrow bag of formal tricks made their songs smack of dilettantism. Nevertheless, their music was enjoyable, and it was nice to sit back, nod your head along to the beat of the drums, and let the sounds wash over you. Chicago's D. Rider took the middle spot, performing a set of weird, discordant avant-rock with a strangely hypnotic live show. Their charismatic frontman/guitarist threw shapes like nobody's business, owning the stage in a bizarre mix of spastic energy and contorted control. Two keyboard synth players augmented the band's sound, at times also chiming in on bari sax and trumpet, which added an unsettling harmoniousness to the songs. The crisp, pulsing beat of the drums held the band's sound together and gave the audience something to hang their ear on. Add to all this the frontman occasionally digging into his pocket and throwing out a handful of confetti during songs, and it's clear that the band flirts with the line between avant-garde and downright pretension, but they seem to have the chops to back it up. If their performance this evening was typical, I would highly recommend checking them out the next time they play live in town. Headliners Mission of Burma first met, and then exceeded expectations with respect to their live performance. I was pleased to find that their live sound, as on their albums, is brash, bold, and larger than life, and their live show is a lot of fun to watch. Guitarist Roger Miller moves around a lot, swaying and shaking to the beat and creating a visual flourish to those biting guitar flourishes that make the band so exciting to listen to. From behind a plexiglass wall set up around his kit, drummer Peter Prescott laid down booming, bombastic beats and chimed in on vocals. On bass, Clint Conley cemented the band's live sound, and his facial expressions while singing were particularly entertaining. It was clear during the set that the band was having a really good time, and the crowd ate it up. In response to one fan's repeated shouts of "Louder!" between songs, Miller elicited laughter from the audience with his suggestion that he "Go stand right next to the P.A., it does the same thing." After a fair amount of cheering, the band returned to the stage, doing a four-song encore that closed the evening in a blaze of energy, kicking the show up from pretty great to excellent. People got especially rowdy during "That's How I Escaped My Certain Fate", dancing and moshing and singing along to all of the numbers the band did in their well-earned encore. If you missed out on tonight's show, you can still catch Mission of Burma tomorrow (Saturday, July 31) at the 2010 Wicker Park Festival (they are scheduled to play on the North Stage at 7:30 pm). Admission to the all-ages festival is free with a suggested donation of $5.